This Economy Writing Board gives kids a posture-perfect writing surface. A 20 angle compensates for fatigue in the back, neck, shoulder, and eye muscles. Enhances concentration, too. Made from sturdy corrugated plastic and folds flat for storage. Has a 12" x 12"(30.5 x 30.5cm) surface area. Search Writing Boards for more options. 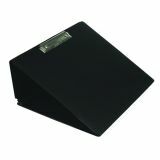 Sold as Single Unit Helps reduce back, neck and shoulder pressure and eye strain Angled for optimal positioning Large surface area with low-profile metal paper grip-clip Lightweight unit folds flat for travel and compact storage.